The SDSA mourns the loss of two well established and respected set decorators from the film community: Lee Poll and Warren Welch. 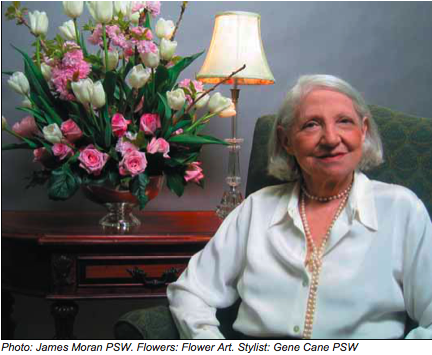 For those of you who may not know their body of work, we begin this memoriam with a celebration of Warren Welch compiled by Rosemary Brandenburg and then with a reprinted article about Lee Poll from Set Decor Magazine Summer 2004. Warren Welch, a Hollywood set decorator for more than four decades, died Oct. 15 in Los Angeles of pancreatic cancer. He was 82. Welch served as head of Decorating, Property, Hair, Make-up and Costumes at CBS from 1968-87, then worked as director of production services at MTM Enterprises from 1987-94. Started in Motion Pictures in 1960 at 20th Century-Fox as a Prop man. When he joined the Academy his position had been for 9 years as Department Head of Property & Decorating, CBS Studio Center. He joined the Academy 11/8/76. Worked at 20th for 7 years then to CBS. The film business was very different in the 1970s and 80s. Studios had Department Heads who could help us acquire jobs, in addition to looking for work ourselves. When I first started in the business, my first job was given to me by CBS Decorating Department Head Warren Welch, an extraordinary man. That show was called “The Price of Death,” where I got the opportunity to go on location to San Francisco. Warren even helped me pick my first leadman, Dominick Bruno. He recommended decorators for different jobs on the CBS Studio Center lot (MTM). I really have to call this a thank you letter from the bottom of my heart, because I have had such a great and long lasting career. I met Warren in 1980 when I did the pilot to "Hill Street Blues." pleased with our good health and were always happy to see each other. his family my deepest sympathy. I found Warren to be a very nice man. In our conversations I remember him telling me he grew up back in the NYC area. He started in the business, actually as a member of IATSE Local #1. This was one of the most powerful stagehand locals in the country. Their jurisdiction covers Broadway, Lincoln Center, Music Halls, and a good bit of live TV. I don't recall when he arrived in Hollywood, but I'm sure it was about the middle 1960's. He was the head of the dept. at MTM in 1988 and was no longer decorating as he had some heart trouble. I was 9 1/2 months pregnant with my youngest and he offered to take my show over until I could come back. I was so worried that the stress may be too much for him that I came back two weeks after her birth. Of course looking back I was not in terrific shape myself! He was a generous thoughtful man and I will always remember him with great fondness. He was also a wonderful dresser and always looked like he just stepped out of a men's magazine. He carried himself with grace and dignity and I am better for knowing him. Warren gave me my first show in America when I moved here from 15 years living and working in Italy. I had no U.S. resume. Just a portfolio under my arm and he still gave me my first U. S. union show. I talked to him a couple months ago. He wasn't thrilled to be ill...but it was great to talk with him. I think he also gave Cheryal Kearney her first job. Gary Oseransky at Uni was close to him. He is so appreciated. Patti, his wife is head of Wardrobe still I believe at Warner Brothers. He was 83 when he passed. He came from New York Local 1, as did his father and grandfather. Before coming to Hollywood, he stage-managed a large Cuban musical review at the Fontainebleau Hotel in Miami Beach, FL. While there he hired many of the unemployed Local 1 members to be a part of his crew. Eventually the U.S. sent most of his cast packing back to Cuba. A former NY union friend, now with 44, called Warren and told him he would be happy to help him in Hollywood, Warren accepted. His first show was “Batman,” as a Fox staff Decorator. From there he did feature films with Frank Sinatra such as “Man With the Golden Arm. In those days whether on a show or not you were carried, wow. I met Warren through his good friend Dominick Bruno. I led for him on the “Adventures of Brisco County Jr.” Warren loved Westerns so much, and his work reflected it. His window treatments, or "rags" as he referred to them, were nothing less than spectacular. I never stopped learning from him. We did the first season of “ER” and then he hung up the hold tags. I've been his good friend ever since, taking him to lunch, movies, and one of his favorite places to eat, Musso & Frank’s grill. I spent the last 5 days of his life at his bedside, making him laugh, and just letting him know how much he meant to me and many others. select just the right amount of furniture that he needed to complete the set. friend that he was then and remained forever. I first was introduced to Warren Welch when I went looking for work after I left Universal Studios in 1965. Warren put me to work on the swing gang with My Three Sons at CBS Radford, and I worked on and off with him for the next forty years. Eddy Denault was in charge of production for CBS Radford studios at the time it was rapidly becoming an elite boutique studio. Pilots, TV shows, Movies of the Week and feature productions were all be filmed at the same time and Warren was the (go to guy) on all of them. 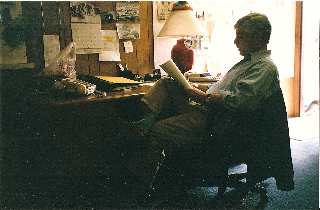 He was one of the first department heads hired when the studio was set up and he remained at CBS Radford until the department was closed in middle 1980’s. Warren was never short on giving his opinion and with his guidance and talent decorated many a pilot and hundreds of episodes for CBS and MTM productions. His good friend Abby Singer, who was in charge of production for MTM (Mary Tyler Moore), would always call upon Warren when they could not find the talent needed to decorate a pilot for MTM. He was disciplined, honest, fair, loyal and an extremely talented working Set Decorator and Department head. Warren’s life in show business started in New York and his work eventually took him to Florida in the heyday of nightclubs and extravaganzas. He decorated many shows at the Fontainebleau and decided after a couple of years that he needed to move to Hollywood to continue nourishing his career. He packed up his bags and took his family west to begin anew. He got his break at 20th. Century Fox Studios, and fortunately for all of us, he never looked back. He became a set decorator and one of his first TV shows was Batman. He worked tirelessly at his craft in the days when you worked until you dropped. Anything that needed to be done Warren handled as a professional and expected anyone working with him to keep up. Many a lead person, myself included, had a very difficult time keeping pace with Warren’s work ethic. He was detailed and never succumbed to the; “that’s good enough for TV” axiom that was so prevalent in those days. He hammered home that point to many of us in the industry and fortunately for many of us his work ethic became our work ethic. Every set he decorated had all of his attention to detail, whether or not it was a back alley full of garbage, or a prairie full of teepees. I worked as his lead person on many a show. We did a MOW in San Francisco with Peter Falk, Vic Morrow, and Peter Lawford and apart from long hours we still managed to hit every bar in San Francisco and get up in time for work the next day. My friendship with Warren grew throughout the late sixties and early seventies and his advice, guidance, and loyalty continued to inspire me as the years went on. I had moved to Europe for a couple of years and stayed in touched with him sending post cards and writings. When I returned, flat broke, the first person I went to see for work was Warren. His best piece of advice came with his pointed finger in my face when he said, “Enough already, settle down and make something of yourself.” That lecture, advice, and caring manner of his changed my life forever. There was a new pilot being shot at CBS Radford called, of all things, Spencer’s Pilots. Warren encouraged me to take the Show because he decided that I would be a better property master than a set decorator. My first shot in the big leagues came from Warren and off I went on my first series and to many new adventures. Warren loved to play golf but hated the fact that it took so much work. His next new love was snow skiing and along with our wives we traveled to many a place in search of snow pack. He was pretty damn good given he didn’t take the sport up until his late forties. He could ski anything and we would have the best of times no matter where we were. It is interesting to try and recall one’s history throughout one’s life, there are so many chapters to Warren’s story and my few words here do not come close to describing this man that I was lucky enough to know and love. His generosity, tutelage, and guidance were responsible for some of the finest Set Decorators and Property Masters still working within our business. Warren set the bar very high for those of us he cared about, and each and everyone that listened to him became a better person for knowing him. He was a class act and was always there for me. That’s just the way it was with the two of us. He was my mentor, friend, advisor, best man, and my professional life, in large part, is a result of Warren’s guidance and support. He lives within my heart and much of him rests in my soul. I will miss him forever and I will never forget all that he has helped me to become. At age 55, Lee Poll became single and without money or job. SOAPDISH and PLACES IN THE HEART. costume designing for leads Sara Miles and Kris Kristofferson. independents, Lee’s career began at the top and stayed there. brilliantly talented.” Lee continues, “He was so funny. in an array of colors and turn-of-the-century furnishings. with surroundings in which the heroine can thrive. meeting with Lee, Lansbury saw no need for further interviews. Lee was the set decorator she wanted. knows acting. She knows decorating. She knows costume. just as Gene Callahan once served as mentor to her.